The Holy Spirit is Working in You! 24This is the disciple who testifies to these things and who wrote them down. We know that his testimony is true. 25Jesus did many other things as well. If every one of them were written down, I suppose that even the whole world would not have room for the books that would be written. Why all of the mystery? 25These things have I spoken unto you, being yet present with you. 26But the Comforter, which is the Holy Ghost, whom the Father will send in my name, he shall teach you all things, (through revelation and practice) and bring all things to your remembrance, whatsoever I have said unto you. 27Peace I leave with you, my peace I give unto you: not as the world giveth, give I unto you. Let not your heart be troubled, neither let it be afraid. Come now, and let us reason together,saith the LORD: though your sins be as scarlet, they shall be as white as snow; though they be red like crimson, they shall be as wool. 12Therefore, since we have such a hope, we are very bold. 13We are not like Moses, who would put a veil over his face to keep the Israelites from gazing at it while the radiance was fading away. 14But their minds were made dull, for to this day the same veil remains when the old covenant is read. It has not been removed, because only in Christ is it taken away. 15Even to this day when Moses is read, a veil covers their hearts. 16But whenever anyone turns to the Lord, the veil is taken away. 17Now the Lord is the Spirit, and where the Spirit of the Lord is, there is freedom. 18And we, who with unveiled faces all reflect the Lord’s glory, are being transformed into his likeness with ever-increasing glory, which comes from the Lord, who is the Spirit. This entry was posted in Read between the lines. Understand the deepest meanings. and tagged Christ, Enduring to see Jesus come again, eternal, eternal flesh, everlasting body, Gospel, health, Heaven, immortal, obey, power, sinless flesh, temple of God on November 27, 2012 by literalgospel. “Give no thought for your life concerning food, drink, and clothing,” or any other worldly commodity (physical need). Do Christians focus their prayers on worldly requests, that even a sinner may obtain through alternate means? Apostle Paul clearly illustrates the blessed ability of applying “Faith in God” to literal situations and circumstances. Paul declares in Hebrews (New Living Translation, 2007) 11:32 “How much more :do I need to say? It would take too long to recount the stories of the faith of Gideon, Barak, Samson, Jephthah, David, Samuel, and all the prophets. 33 By faith these people overthrew kingdoms, ruled with justice, and received what God had promised them. They shut the mouths of lions, 34 quenched the flames of fire, and escaped death by the edge of the sword. Their weakness was turned to strength. They became strong in battle and put whole armies to flight. 35 Women received their loved ones back again from death. But others were tortured, refusing to turn from God in order to be set free. They placed their hope in a better life after the resurrection.36 Some were jeered at, and their backs were cut open with whips. Others were chained in prisons. 37 Some died by stoning, some were sawed in half,d and others were killed with the sword. Some went about wearing skins of sheep and goats, destitute and oppressed and mistreated. 38 They were too good for this world, wandering over deserts and mountains, hiding in caves and holes in the ground. How many present day Christians use their “Faith in God” to perform life saving miracles, or death-defying acts? Has the application of faith been weakened instead of increasing? According to Paul’s final sentence on faith: “For God had something better in mind for us, so that they would not reach perfection without us.” Do you suppose we are appointed to do perfect acts of faith that make the episodes of our forefathers pale in comparison? Would overcoming physical death by believing, having faith in, and manifesting Jesus’ word qualify as an astounding feat of faith? Our beloved, great-ancestors of faith would give a standing ovation to anyone who overcame physical death and the grave, by faithfully manifesting and obeying John 8:51. This entry was posted in Receiving Immortality and tagged Christ, Enduring to see Jesus come again, eternal, eternal flesh, everlasting body, God, health, Heaven, immortal, longevity, obey, power, sinless flesh, temple of God on November 10, 2012 by literalgospel. According to Jesus, people have the tendency to talk about Christ but not practice the commandments of the Gospel. In the book of Mark chapter 7 verse 7, Jesus sternly warns against this hypocrisy by saying, “Their worship of me is worthless, because they teach human rules as doctrines.” (International Standard Version, 2008) It is incumbent for true believers to validate their genuineness to Christ by consistently discerning God’s Word from human rules, opinions, and clichés. Moreover, once the distinction is known, believers always choose to obey God rather than man. Apostle Peter exemplified this type of thinking and behavior in Acts 5:29, “But Peter and the apostles answered, We must obey God rather than men.” He made this statement in the face of certain persecution, to illustrate the importance of being loyal to God’s Word. The Information Age offers a different challenge to present day true believers. They must discern between the human rhetoric perpetually transmitted on a global scale, and the pure Gospel which Peter proclaimed “must be obeyed.” This process takes place in the human heart, and the individual mind makes the choice. Are the words you treasure just human cliché? Or do you live your life according to the catch phrases of God? Either way the choice is perpetually yours, Cliché or Catch Phrase, God or man? This entry was posted in Receiving Immortality and tagged Christ, Enduring to see Jesus come again, eternal, eternal flesh, God, Gospel, health, Heaven, immortal, longevity, obey, power, sinless flesh, temple of God on November 3, 2012 by literalgospel. “Abundant Life” according to Jesus? Before adorning a new garment, it is necessary to take off the old. By the process of elimination, let us first examine what is not abundant life according to Jesus. By reading Jesus’ encounters in Matthew 19:16, we find a man asking for abundant life; “And, behold, one came and said to him, Good Master, what good thing shall I do, that I may have eternal life?” Please note this request was for abundant life that never ends. Do you suppose “eternal life” could be the maximum measure of an abundant life? I suppose so, do you? Nevertheless, Jesus granted the man’s request for eternal life, by giving him a task to fulfill, a stipulation as it were. Astoundingly, the requirement to receive the most abundant life of all (eternal life), called for the man to rid himself of all money, wealth, and secular riches! Chapter 19 of Matthew says, “21 Jesus said unto him, If thou wilt be perfect, go and sell that thou hast, and give to the poor, and thou shalt have treasure in heaven: and come and follow me. 22 But when the young man heard that saying, he went away sorrowful: for he had great possessions. ” Do you suppose Jesus meant what he said? If the man got rid of his riches would Jesus give him the most abundant life of all, eternal life? 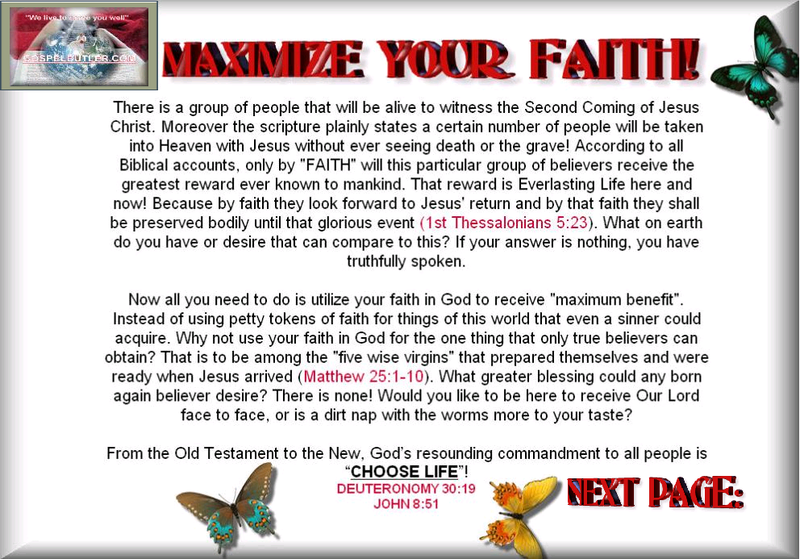 The meaning of abundant life according to Jesus is exactly the opposite of financial blessings or monetary windfalls. Jesus said, “if you have it, get rid of it!” He did not say, “in a few days hence you will receive a bundle of cash.” Abundant life is not money, at least “according to Jesus”! Do you agree? As always, we use the scriptures to define and explain the scriptures. By consistently using this process we are assured that our understanding of God’s word is untainted by human opinion. In the book of Luke, Jesus profoundly states the composition of abundant life does not include money or possessions! “And he said unto them, Take heed, and beware of covetousness: for a man’s life consisteth not in the abundance of the things which he possesseth.” (KJV, Luke 12:15) If you have a modern translation Bible it says, ” Then he said, Beware! Guard against every kind of greed. Life is not measured by how much you own.” (New Living Translation, 2007) Subsequently, since life is not measured by “how much you own,” abundant life is abundantly not measured by “how much you own.” Wow, I get the picture! Do you see what Jesus is saying? With all of my heart, I hope so. Who is the recipient of eternal life, “according to Jesus”? What shall I do to have eternal life, “according to Jesus”? In one of the preceding paragraphs it is said, “you and I can seize the opportunity for eternal life/abundant life which the young man declined, if we just keep the commandments.” This refers to the young man Jesus encountered in Matthew 19:16-17 who was unable to keep a specific commandment regarding disbursal of his earthly fortune. That young man received one direct commandment from Jesus, and with a heart of disobedience, turned away from Christ to resume his worldly lifestyle. However, in this dispensation we have the entire Gospel of Christ to obey in order to receive eternal/abundant life (John 8:51). What must we do in order to succeed where the rich young ruler failed? How about obeying the Gospel commandment which specifically orders us to live forever? Our biblical protocol is to let scripture define scripture, being consistent in our regimen requires a supporting and defining scripture for John 8:51. Overall, Jesus’ stipulation to “keep my sayings” and “obey my teachings” requires perfect submission to the doctrine of the Gospel. In laymen’s terms, if Jesus said it, do it. Whatever is written in the Gospel is not just my belief, but my lifestyle, my character, my mindset, my hopes, aspirations and expectations. In other words, I am the physical manifestation of the Gospel. This new creature is described by apostle Paul thusly, “I have been crucified with Christ and I no longer live, but Christ lives in me. The life I live in the body, I live by faith in the Son of God, who loved me and gave himself for me” (New International Version, 1984). Paul’s profound declaration describes a creature that abides by the Gospel of Christ, because it is inhabited by the Spirit (attitude, personality) of Christ. These new creatures know what Christ knows, behave how Christ behaves, and obey the commandments that Christ obeys. Understanding this correlation is essentially what I must do in order to obey the Gospel commandment that corresponds to John 8:51. That corresponding commandment is John 12:50, “And I know that his commandment is life everlasting: whatsoever I speak therefore, even as the Father said unto me, so I speak.” How many people don’t realize the fact that everlasting life is the commandment of Christ recorded in John 12:50, and not a reward received after death? How many people have been doing what Christ commanded in this regard? To answer the question, “what must I do to have eternal life? I must simply obey his commandments, including John 8:51 & John 12:50, thusly live without ceasing. That’s what, “according to Jesus”! Discovering where eternal life is “according to Jesus” proves to be just as astounding as every miracle he performed. The excerpt of John 14:3 in the header reads like this in its entirety, “And if I go and prepare a place for you, I will come again, and receive you unto myself; that where I am, there ye may be also.” Jesus made this promise to his disciples and believers to illustrate the continuance of our physical relationship with the Lord. Christendom is founded upon three related principles. The first is, everything in scripture concerning Jesus Christ is true. The second, Jesus Christ is physically alive and sits in majesty in Heaven.The third, Jesus is coming back to earth and will collect his people when he returns. Because Christians hold these truths as evidence through their faith in Christ, the where of eternal life is understandable to them as a group (“the body of Christ”). Jesus is physically alive, he does not reside in the netherworld of disembodied souls. Christians of every denomination, shout to the heavens, “We serve a risen savior!” Subsequently, Jesus Christ is in this dimension that we call life, the universe, the cosmos, existence, the land of DNA. Moreover, when Jesus arose from the grave he scolded a particular disciple for not believing the fact that Jesus was physically alive. In the book of John chapter 20 it is recorded, “27 Then he said to Thomas, “Put your finger here; see my hands. Reach out your hand and put it into my side. Stop doubting and believe.” 28 Thomas said to him, “My Lord and my God!” 29 Then Jesus told him, “Because you have seen me, you have believed; blessed are those who have not seen and yet have believed.” Every believer of Jesus’ physical Resurrection and ascension is blessed because of their faith in God’s Word (according to Jesus). Where is Jesus? Right here, but in another part of the physical universe, and believers have permission to be with him forever. Because Jesus is in this dimension of existence, believers know by faith, that there are eternal beings living in our universal atmosphere. But where do you and I come into this picture of physical immortality? Jesus made it easy for us by one simple commandment, “Have faith in God.” (Mark 11:22) These are the instructions of Jesus for all believers who desire to accomplish what the world would call impossible. Moreover, once a person “has faith in God” through obedience to the Gospel, God reveals the location of eternal life (aka abundant life). Zechariah 4:6 exclaims, “So he said to me, “This is the word of the LORD to Zerubbabel: ‘Not by might nor by power, but by my Spirit,’ says the LORD Almighty. Simply put, physical manifestation of eternal life, becoming immortal, overcoming physical death, is accomplished by abiding in God’s Spirit for that exact, specific, reason and purpose. Where is God’s Spirit? Jesus did not only format a protocol for receiving God’s Spirit into your heart, he also put God’s Spirit in your hands, so that civilization could use it to its fullest capacity. In order for people to effectively apply God’s Spirit to life’s circumstances, Jesus made the Spirit visible to the naked eye. In John 6:63 Jesus gives the Spirit of God to all of us, in no uncertain terms. “The Spirit alone gives eternal life. Human effort accomplishes nothing. And the very words I have spoken to you are spirit and life.” (New Living Translation, 2007) According to Jesus eternal life is given by The Spirit. According to Jesus the words that he spoke are The Spirit and life. Subsequently, Life eternal is in the Gospel, those sentences and paragraphs which are written in red, in your Bible. The question is, where do you stand in regards to abiding in the Gospel? Do you know the Gospel by heart? More importantly, do you do the Gospel with all of your heart? Where is eternal life, henceforth known as “abundant life”, according to Jesus (John 10:10)? Eternal life is in The Gospel of Christ, “Heaven and earth will pass away, but my words (The Gospel in red) will not pass away.” (Mark 13:31) Moreover, eternal life is The Gospel of Christ, since it is the doctrine which Jesus proclaimed is eternal (“shall not pass away”). The question you must answer is where are you in relation to The Gospel? Is it in you, and you in it? If so you have an eternal entity living inside of your physical body. Do you live in it? In other words do you live according to the commandments of The Gospel within you? “And I know that His commandment is life everlasting” (John 12:50); “Truly,truly, I tell you, if a person obeys the Gospel they will never die.” (John 8:51). When you abide in The Gospel (through obedience) and The Gospel abides in you (knowing the words by heart) you are immortal here and now just like Jesus and The Heavenly Father. According to Jesus in the book of John chapter 17:22 “The glory that you have given me I have given to them, that they may be one even as we are one, 23 I in them and you in me, that they may become perfectly one, so that the world may know that you sent me and loved them even as you loved me.” This perfect love and oneness is manifested in your physical eternal transformation, and everlasting state of being, welcome to the flock of immortals who have overcome physical death! This entry was posted in Receiving Immortality and tagged Christ, eternal, eternal flesh, everlasting body, God, Gospel, health, Heaven, immortal, life, longevity, obey, power, sinless flesh on October 23, 2012 by literalgospel. Manifesting John 8:51 in the flesh! Throughout the New Testament the death of born-again believers is described as “falling asleep.” In subsequent posts we will explore the reason for this new designation of death in regards to those who belong to Christ. This entry was posted in Receiving Immortality and tagged Christ, eternal, eternal flesh, God, Gospel, health, Heaven, immortal, life, longevity, obey, power, sinless flesh, temple of God on October 21, 2012 by literalgospel. I challenge you to “physically” live and never die, just like me! A wise man once said, “What good is it to have everything you want and then you die?” Does that sound familiar? More importantly, can you agree with that statement? If so, it is very likely that you will be victorious in “The Challenge of Your Life.” Welcome to Literal Gospel, hosted by Elders Rod and Geneva. We literally do not want you to die, because someone has already died in your place. The opening quote is located in the Bible @ Matthew 16:26. This profound statement does not require religious belief, only good common sense and a honest heart. Other variations of this statement read; “And what do you benefit if you gain the whole world but lose your own soul? Is anything worth more than your soul?” (New Living Translation, 2007); “What good will it do for people to win the whole world and lose their lives? Or what will a person give in exchange for life?” (God’s Word Translation, 1995). No matter how it is said, what can you do about it? How can people not lose their lives? Suppose physical longevity required more than good nutrition and exercise? I owe it to myself to investigate whatever elements are necessary to sustain my body for as long as possible. Literal Gospel is a collaborative site where everyone can share their views on the value of life, and feel free to share questions and answers on the subject that touches us all. Staying alive! The Gospel is literally filled with profound statements which have perplexed civilization since the days of antiquity until the present. Without a doubt, the ability to discern the difference between parables and commandments in the scriptures, is a matter of life or death. Simply put, the missing element in obtaining physical longevity, is the ability to understand the instruction manual of life aka The Bible. Jesus Christ lived a life adorned with miracles and astounding events. He clearly states that the power of living life without death is hidden within the words he left behind. Do you suppose this power is the key to physical immortality, here and now? What does John 8:51 mean to you? Since Jesus never lied or exaggerated, do you suppose he meant what he said in John 8:51 literally? We do! This entry was posted in Read between the lines. Understand the deepest meanings., Receiving Immortality and tagged Christ, eternal, God, Gospel, health, Heaven, immortal, life, longevity, obey, power on October 16, 2012 by literalgospel.